I am entirely in favour of out-crossing to another breed of dog when a pedigree breed loses its breed-type, its vigour and virility or its functional anatomy. Pioneering resourcefulness in such out-crossing led to the creation of our famous modern breeds in the first place. I am totally against stubbornly insisting on pure-breeding when it clearly isn't working. The Bulldog and the show Basset Hound are classic examples of breeding for the pedigree and not for the dog. Neither can carry out its original function and so cannot be true to type; both are riddled with anatomical handicaps. 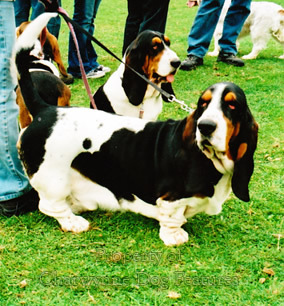 Full marks to the working Basset fraternity for out-crossing to the Harrier to retain function and the worthy Bulldog fanciers, like the late Ken Mollett of Pinner who, shaming the show ring bunch, have recreated the real English Bulldog. Edwin Brough, who played such a key role in developing the modern Bloodhound, advocated an outcross every fifth generation. Who listens to him now? The show Bloodhound of today is a compounded exaggeration of itself. An outcross to the Bloodhounds of the packs, so easily an immediate solution, was turned down by the show people. Any breed, bred within a closed gene-pool for two centuries, has lost genetic diversity - the inevitable consequence of pure breeding. In spite of the craving for pure unsullied blood, invented breeds like the Kromfohrlander, the Chinook, the Eurasier and the Kyi-Leo, the first-named from an accidental mating between two breeds kenneled together, are now recognised as breeds abroad. Where is the logic in such recognition? It makes the insistence on closed gene-pools look absurd. Of course crossing two breeds needlessly doesn't make sense, if necessary when the production of say a purpose-built lurcher is desired. Designer dogs bred for the dog-market are usually casually-bred entirely for profit. But when cross-breeding improves a breed it should surely be welcomed; injudicious cross-breeding however without skilled advice and shrewdly-selected material should always be avoided. There are no magic answers in breeding, the selection of breeding stock based on diligent research is always the way forward. But the choice of breeding material should be based surely on need, not dogma. In recent years I have seen two 'Mastiffs' which conformed to the type depicted in so many 17th, 18th and early 19th century portrayals. 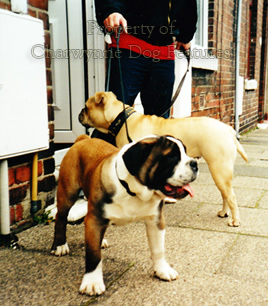 One was a Mastiff-Staffie cross and the other a Mastiff-Bullmastiff cross. 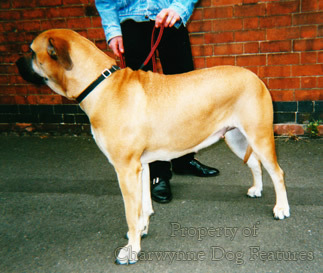 The Mastiff of the show ring is for me a fawn Alpine Mastiff, lacking the anatomy of our famous native breed. That may not be surprising, bearing in mind the blend of breeds behind the Mastiff's re-shaping in the 19th century, but is it historically correct? Once, at an Irish Wolfhound ring, I watched a shaggy exhibit for a while and then remembered where I had seen that 'look' previously - in the depiction of an early importation of a Tibetan Mastiff. Capt Graham, re-creator of the Irish Wolfhound used a Tibetan Mastiff sire 'Wolf' on the wolfhound 'Tara' and their offspring appear in the pedigree of every modern Irish Wolfhound. Inspired Dutch breeders have imported 'Greydogge' blood (a cross between a Mastiff and a racing Greyhound) from Australia in order to revitalise their Irish Wolfhounds. What an outrage! will shout the perpetuators of tired blood in every pedigree breed! What vision is my cry! It is always a risk when crossing two breeds or introducing outside blood into a breed that too much of one feature will crop up in time to the detriment of true breed type. A closed breed gene-pool is unlikely to provide redress. Only once have I detected this 'Tibetan Mastiff look' in an Irish Wolfhound, but I see the 'Alpine Mastiff look' in every contemporary Mastiff ring I view. 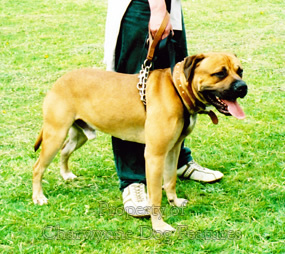 The Mastiff of England was a hunting dog, a hound; the Alpine Mastiff was a mountain dog, requiring bulk and less athleticism. The mountain dog anatomy is now dominant and in my view true type has been lost in this famous native breed. But the breed fanciers seem happy with their stock, which is disappointing. 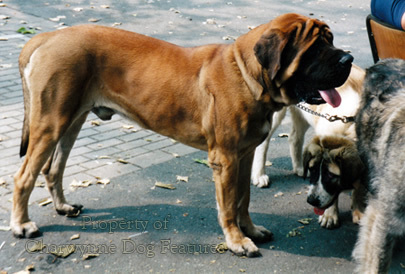 The Mastiff is a feature of our canine heritage and should not be represented by an alien form. If this breed has been 're-created' once and that action condoned, why can't it be done again and with greater historical accuracy this time? All of this will make the working terrier and lurcher devotees shake their heads knowingly. 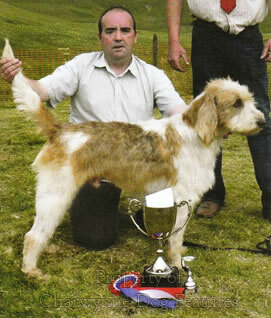 But unknowingly they are the only dog breeders to remain true to our national heritage. Rarely are they dazzled by pieces of paper! 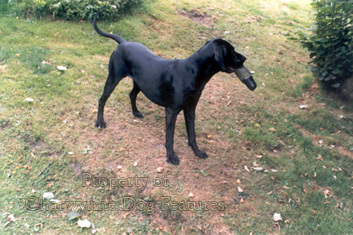 Sensible people seeking good sound functional lurchers and terriers go to known breeders. "Papers" are never the major desideratum. 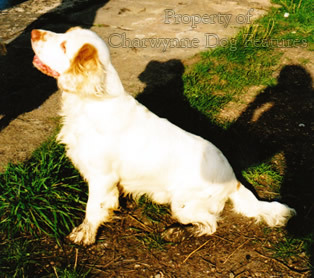 Some enlightened gundog men have long done the same, as the sprockers and the working Clumber illustrate. 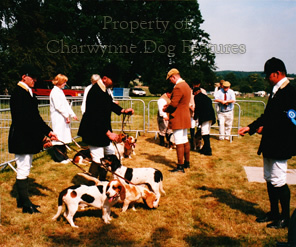 The best bred dogs in Britain for over two centuries are almost certainly those in the hunting packs, Staghounds, Foxhounds, Harriers and Beagles valued for their ability in the field rather than the purity of their pack or their papers. Show breeders should go and view their immense virility. 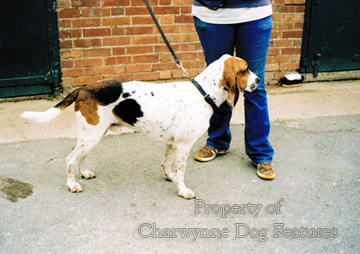 In the Foxhound category come the sister-breeds of Welsh Hound, Fell or Hillhound and the Trail Hounds. Each one, like the American Foxhound and the Gascon Hounds of France, strengthening the Foxhound blood in the packs' breeding programmes. Seeking to improve your 'breed' is an honourable pursuit! To sell flawed pedigree pups to an unsuspecting buyer is despicable; to describe every cross-bred dog as a mere mongrel or dismissively as a mutt is ungracious and often quite inaccurate. The best hound I saw at a local Foxhound kennel's open day was a Beagle-Basset cross. A Weimaraner-black Labrador cross also impressed me in recent years. 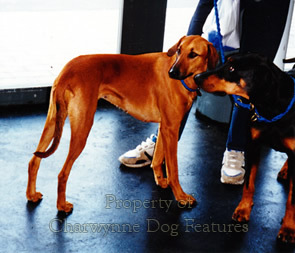 I saw a Dobermann-Azawakh blend at a World Dog Show in Vienna that looked far sounder than some of the class-entries there! 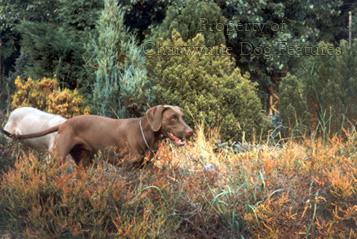 An accidental mating of a Weimaraner and a Dalmatian produced the 'Dalmaraner', an easily-sold litter of fine pups. 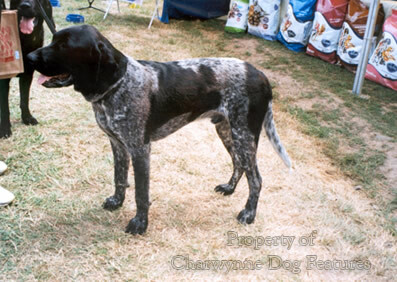 Working as gundogs, I have learned of Springer-Lab, Whiptail-Large Munsterlander, Chesapeake-Goldie, Newfoundland-Pointer and Pointer-Braque Francais mixes that delighted their owners with their field performance. 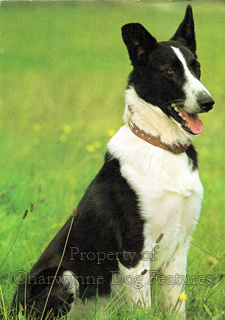 A combination of Border Collie and GSD has also produced impressive offspring. But the secret of this success was not the genetic or inherited prowess of the ingredient breeds but from the capabilities of the sire and dam in each case. There is no magic formula in breeding dogs that work - as always, it's the blend of top-class blood not breed that produces the goods. As always, selection of stock determines the outcome, not lengthy consultation of 'papers' or resorting to a rosette-winning sire. Uninformed out-crossing is not the answer; there has to be research as well as vision; the urgent need for new blood however demands early attention. Leading geneticist Professor Steve Jones has stated that for pedigree breeds of dog 'a universe of suffering' is ahead with continued inbreeding. Fellow geneticist Bruce Cattanach has written: '...inbreeding has been ingrained in dog breeder psyche from the beginning and is hard to break, even when it is possible to show that it is not the most successful way to breed'. 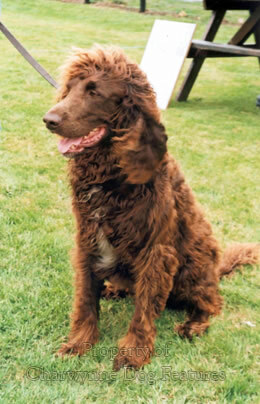 He went on to state that some pedigree breeds may well become extinct in our lifetimes without intervention, advising out-crossing to other related breeds. But who will listen to him; dogma will prevail and not just lurchermen will wonder at such folly - and such damage to long-established breeds. 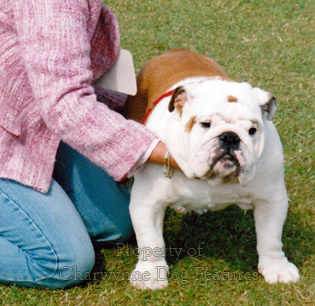 One of the weaknesses of the otherwise quite excellent Bateson Report into the state of pedigree dog-breeding in Britain was that it didn’t gather any valuable evidence on the genetic size of each registered breed. This report uses the expression ‘closely related breeding pair’ when discussing the mating of dams with sires, but doesn’t define what closely related actually means. The publication by the KC of inbreeding ratios for each breed recognised by them is a huge step forward. However welcome, I don't expect to see, in the foreseeable future, advertisements such as: "Basset Hound (prone to slipped discs) for sale"...or "Labrador (prone to hip dysplasia) at stud"...or "Skye Terrier (quite unlike its ancestors) for sale"...But perhaps one day, nudged by the Sale of Goods and Trades Descriptions Acts, our local papers will feature a more valuable style of 'dog for sale' notice, on the lines of: "For sale, healthy yellow Labrador puppy, parents hip-scored, eye-tested, with sound temperament and no known inheritable diseases..." Does that not mean more than the empty boast of 'excellent pedigree'? Function was once the 'pedigree' of sporting dogs not a piece of paper. Genetic diversity is a, if not the most, valuable tool in the breeding of a healthier dog and if we really care about the domestic dog, we should be pursuing it with enormous zeal!